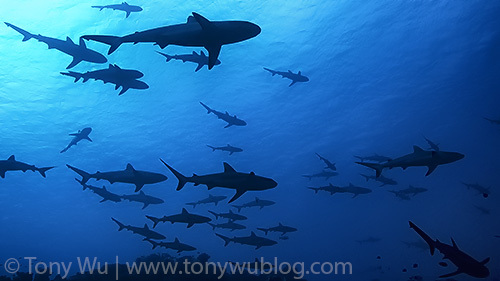 It's nice to see so many sharks...alive. 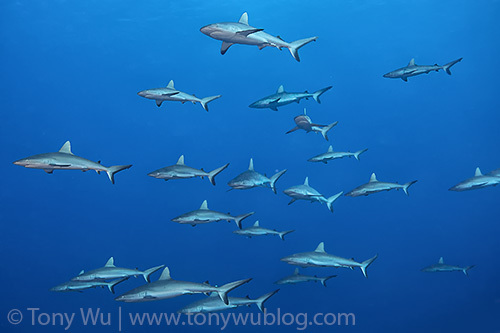 They were mostly grey reef sharks (Carcharhinus amblyrhynchos), but there were silvertips (Carcharhinus albimarginatus) in the mix, and blacktip reef sharks (Carcharhinus melanopterus) in the shallows as well. I even saw a large blackfin reef shark (Carcharhinus limbatus), only the second I’ve ever come across. I just hope these sharks and their kin survive the onslaught of ignorant, insecure, indifferent people in Asia who seem hell-bent on exterminating them for their fins.